Total Hip Replacement (THR) is a very successful treatment for end-stage degeneration of the hip joint; over 55,000 THRs are performed in the UK each year. Despite technological advances and our increased understanding of hip replacement surgery, between 5-10% of hip replacements will fail and require revision within 10 years. The most common cause of hip replacement failure is aseptic loosening due to implant wear, although other factors such as infection, trauma and recurrent dislocation can all result in the need for revision surgery. The most widely used hip replacements consist of a metal ball articulating with a plastic (polyethylene) socket. Although these implants are designed to withstand the substantial forces that are transmitted across the hip joint during everyday activities (e.g. up to 6 times body weight when walking normally), the friction of the articulating surfaces results in wear of the plastic socket over time. As the socket wears, small particles of polyethylene are generated. These particles then activate the body’s immune system, triggering an inflammatory response and causing the bone around the hip replacement to be reabsorbed. The result is that the hip replacement becomes loose and painful; this is known as aseptic loosening. As a consequence the hip replacement often needs to be revised. Hip replacements are subjected to greater amounts of wear in patients who are young, active or overweight. The rate of failure is therefore higher in these patients. Wear will also be greater if the hip replacement is not correctly aligned and orientated, not appropriately sized, not securely fixed to the bone and not ‘balanced’ with the correct tension. All of these are factors are dependent upon good surgical technique. It is important therefore that hip replacements are undertaken by orthopaedic surgeons who specialise in this field. Current studies show that modern uncemented hip replacements systems are as reliable, in terms of long-term survival, as cemented systems. Technological advances have produced bearing surfaces with increased longevity which may therefore benefit patients who are young and physically active. Ceramic-on-ceramic bearing surfaces are extremely hard wearing and perform best in terms of laboratory results. Metal-on-metal bearing surfaces also perform well but concerns exist regarding the high level of metal ions released in to the blood by the articulation of these bearing surfaces. A small percentage (about 0.5-1%) of hip replacements become infected. Patients who have had multiple operations on the hip are at higher risk of infection. If the infection is suspected quickly enough, surgery can be undertaken to wash out the infected hip replacement, change the femoral head (and acetabular liner if an uncemented hip has been used), and thereby clear the infection. High doses of intravenous antibiotics are then required for a period of generally 6-12 weeks to ensure that the infection doesn’t recur. 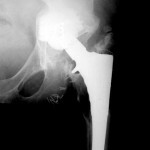 Occasionally the infection persists and the hip replacement must then be removed and a temporary ‘spacer’ inserted. Once the infection has cleared, revision surgery can be performed, usually at least 3 months later. The possibility of infection should be excluded by tests before any revision hip replacement surgery is performed. These tests include blood tests (inflammatory markers), x-rays, possibly a bone scan and often a biopsy of the tissues around the hip replacement. Trauma, such as a fall that causes a fracture of the femur around the hip replacement, can result in failure of the THR. Often the fracture can be fixed and the hip replacement left in place, but if the hip replacement is loose then revision is necessary. Most dislocations occur within 3 months of the initial hip replacement surgery. After 3 months the scar tissue has matured and dislocation is much less likely. When a hip replacement dislocates the soft tissues are damaged and further dislocation is more likely to occur, although this is not inevitable. If the hip dislocates several times it is likely to require revision surgery to prevent further dislocation. More often than not the cause of the dislocation is that the patient has not followed post operative precautions and has put the hip in an unstable position. There are times, however, when dislocation can be attributed to surgical error. 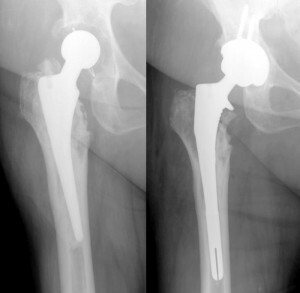 In this instance correction of a wrongly positioned implant is more successful at stabilising the hip than revision hip replacement. Patients who have had multiple operations on the hip are at higher risk of recurrent dislocation. Revision hip replacement surgery involves an inpatient stay of 7-10 days. The surgery is complicated, technically demanding and whilst the risks are the same as for primary THR, the rate of complication is much higher. It should be undertaken by surgeons who have an interest in and are specialised in revision hip surgery. Revision hip replacements are usually performed under a combined (spinal and general) anaesthetic. The old hip replacement is removed with great care in order to protect the surrounding bone. If the original implant was cemented, the cement is generally removed as well. 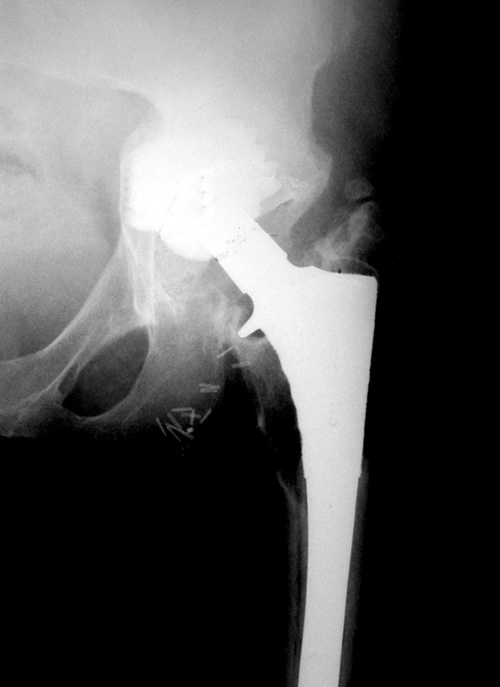 Often there has been significant bone loss as a result of aseptic loosening; a bone graft or additional prosthetic implants may be necessary to allow the revision hip replacement to be properly aligned, orientated and stable. At the end of the operation a drain is usually inserted into the hip joint to draw off excess blood. A dressing is applied to the wound. Foot pumps, elastic stockings and occasionally an injection to thin the blood are used to lower the risk of blood clots forming in the legs. No two revisions are the same; possible difficulties encountered are bone loss, instability causing dislocation, infection, fracture and stiffness. 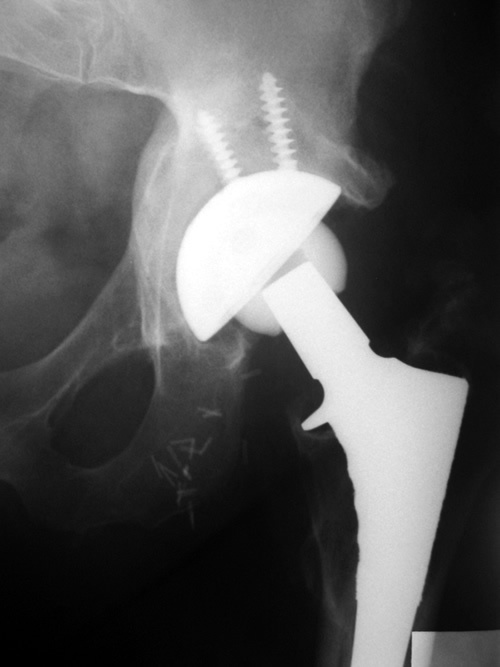 Highly specialised implants may be necessary and the results are not as good as for standard primary hip replacement. However, the majority of patients are very satisfied with the results of revision surgery and obtain very good relief of pain and return to function (see picture). The postoperative recovery from revision hip surgery is similar to that of primary hip replacement. Occasionally a period of restricted weight bearing with the aid of crutches (usually 6-12 weeks) may be necessary. Physiotherapy is essential to assist patients in mobilising after the operation.